An Organic Farming Summer School was jointly organized by FAEL Foundation and the Vocational School for Agriculture “Sergey Rumjantzev” (http://pgss-lukovit.eu) in the town of Lukovit. It was held on 17 – 22 July, 2016 and included a theoretical and practical part. The theoretical part featured lectures and discussions which were held at the Rossitsa Hotel in the St. Constantine and Elena Resort, Varna on 17 – 20 July, 2016. The lecturers at the Organic Farming Summer School were the Managing Board of FAEL Foundation Prof. Dr. Dimitar Hadjinikolov, chairman of the Managing Board of FAEL Foundation and Mr. Milan Kostadinov, organic farms certification consultant with Balkanbiocert OOD, Plovdiv, (http://balkanbiocert.com/bg/). “History and Current State of Organic Farming in the EU and Bulgaria”, by Prof. Dr. Dimitar Hadjinikolov. The practical part of the Summer School was held on 21 – 22 July, 2016 and included a visit to three organic farms in the region of Lovetch. Ms. Tatjana Stoicheva, member of the Managing Board of FAEL Foundation was responsible for the organization. Firstly, there was a visit to the organic farms of Ivan and Rossitsa Danchevi located in the village of Dobrodan. There was a short introduction about the history of the farm. Mr. Tjanko Hristov, a consultant at the Bioselena Foundation in the town of Karlovo (http://bioselena.com/), spoke about the extensive efforts of the farm in the village of Dobrodan to receive certification for organic raising of cows. 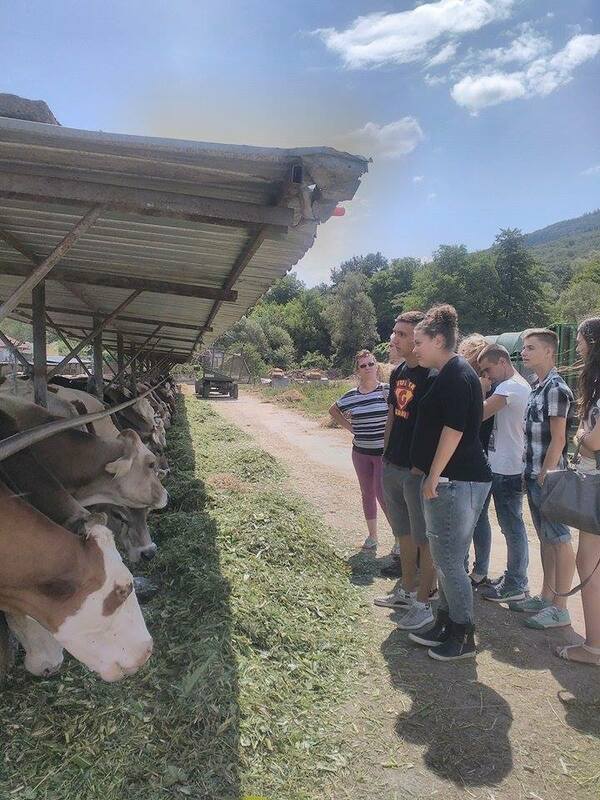 Participants from the Vocational School for Agriculture “Sergey Rumjantzev” showed great interest in getting acquainted with the practical specifics of organic cattle farming and what makes it different from conventional cattle farming. The Danchev Farm can also boast another important achievement: the implementation of energy efficient project which makes it possible to heat water for cleaning the milking system in order to avoid microbiological contamination of the milk. The system uses three energy sources – residual heat from cooling the warm milk, solar energy and an eco-pellets boiler. It is used only if the other two sources are not sufficient. There was also a visit to the Ablanitsa Bio-Farm EOOD in the village of Ablanitsa. This enterprise uses the grazing method to raise chickens, hens, pigs, rabbits and calves. Its manager Ms. Gergana Petkova met the group of students and gave a talk about the ways different animals were raised and the problems faced in the implementation of organic farming. These problems, however, have not discouraged her and now her organic farm has significant achievements, see her website. (http://www.sunnyfarm.bg/). The participants of the Summer School then visited the organic walnut garden of Miroslav Mirchev in the village of Dulbok Dol. He gave a talk about the specifics of organic methods of growing fruit trees, about fruit processing, and above all about the eco-friendly ways to fight tree diseases. Finally, in the afternoon on 22 July, 2016 there was an official closing of the Organic Farming Summer School, at which were present representatives of FAEL Foundation and teachers from the Vocational School for Agriculture. Ten of its students were awarded certificates of attendance. They received congratulations from the head teacher of the Vocational School Ms. Rumjana Georgieva and from the Chairman of the Managing Body of FAEL Foundation, Prof. Dimitar Hadjinikolov.